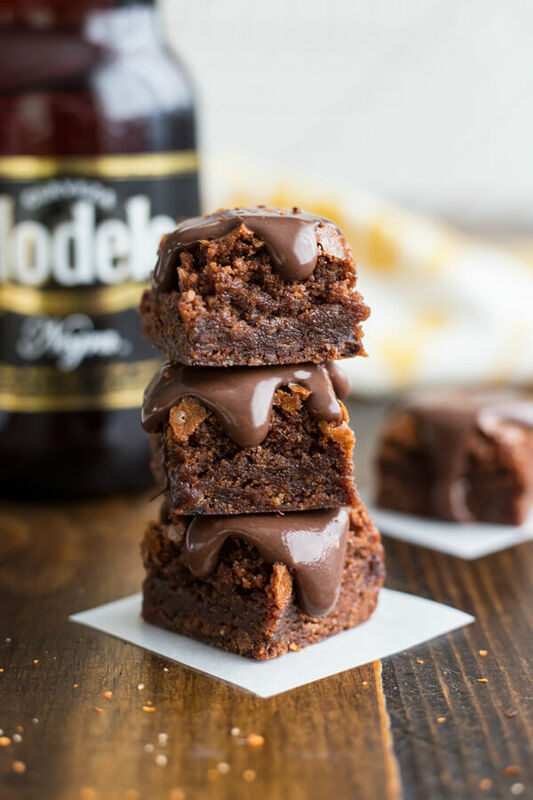 Brownies are good, but Spicy Stout Brownies or Borracho Brownies, as Ryan likes to call them, are even better! They are rich and delicious with a really good kick of heat from the cayenne pepper and a light hint of citrus from the chili lime seasoning. 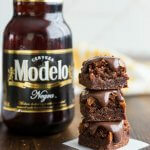 For this recipe, I used Modelo Negra®, which is a medium-bodied lager with slow-roasted caramel malts. It has a rich caramel flavor, perfect to enhance a chocolate dessert. When baking these brownies, or my regular chewy whole wheat brownies, it helps to line the baking pan as shown in the process photos. 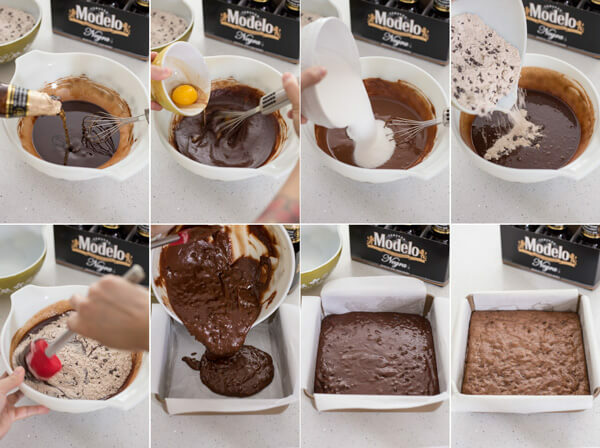 This will allow you to lift the brownie out of the pan easily when it is cooled. Buttering the pan and the first layer of parchment paper will allow the parchment paper to adhere to the pan completely, preventing the excess paper on the side to fall into the brownie as it’s baking. Preparing the dry ingredient ahead of time will help streamline the process when it is time to mix the wet and dry ingredients together. To melt the butter and chocolate for this recipe, you could use a double boiler if you have it. I don’t own a double boiler, so I just place a heat proof bowl over a pot of simmering water as a makeshift double boiler. It works perfectly for making truffles as well. The hot butter/chocolate mixture will help dissolve the cocoa powder, but do allow it to cool down, especially before adding the beer and eggs as you don’t want to cook the eggs at this point. 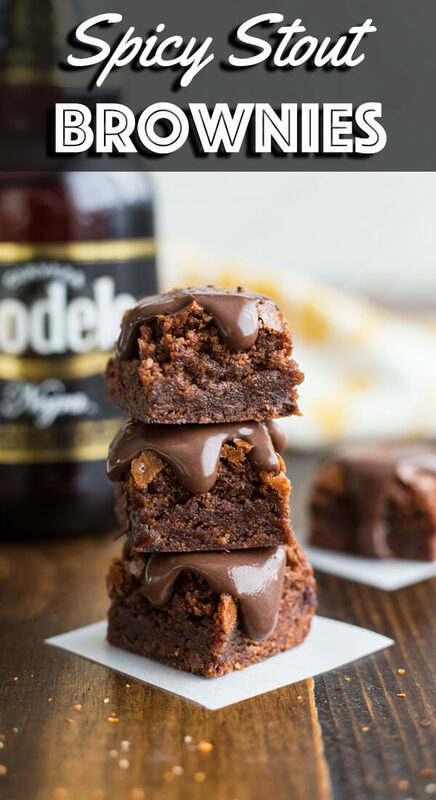 And of course, these Spicy Stout Brownies are made even better with a drizzle of chocolate ganache. 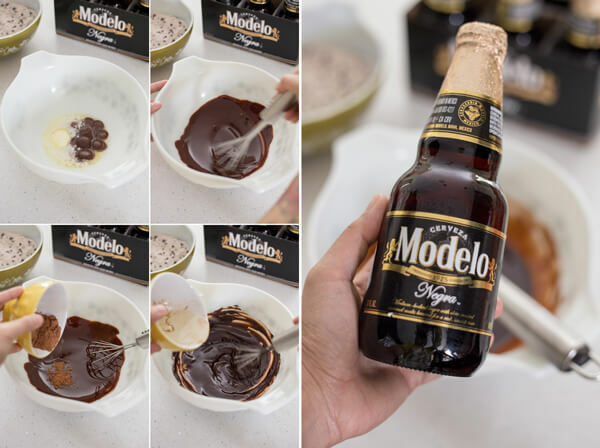 The ganache is spiked with Modelo Negra because the beer’s rich and smooth taste can only enhance it, so I thought why waste an open bottle? I like to use a semi-sweet chocolate or baking wafer for the ganache, as I think it provides the perfect sweetness. But you are welcome to use any of your favorite chocolate variety, even white chocolate. I think the contrast of white chocolate would look great on these brownies. Don’t forget to garnish with a little extra chili lime seasoning for that delicious salty citrusy flavor. 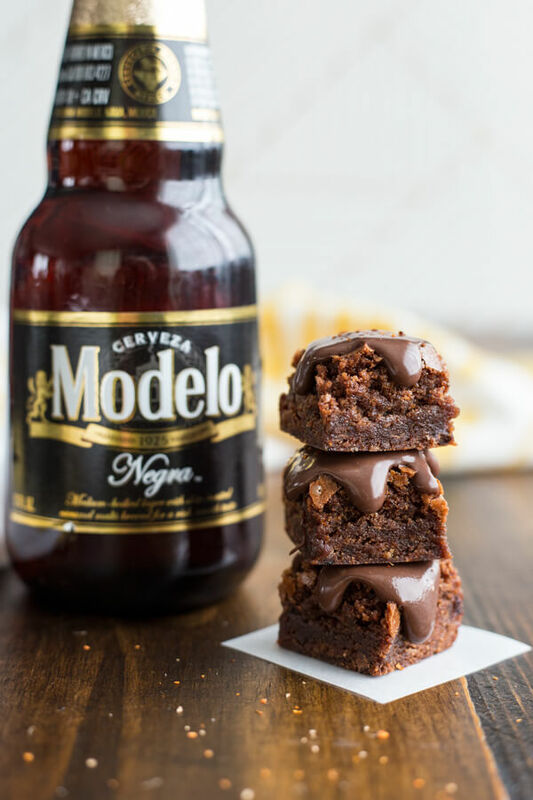 Be sure to use the product locator to find where you can buy Modelo Negra and make these delicious brownies! Delicious and rich Spicy Stout Brownies with a really good kick of heat from the cayenne pepper and a light hint of citrus from the chili lime seasoning. Butter an 8”x8” square baking pan and line with two strips of parchment paper in a cross pattern, leaving excess hanging out on all four sides. In a small mixing bowl, add mini chocolate chip, flour, chili lime seasoning, cayenne pepper, salt and mix with a spatula and set aside. In a large heat proof bowl, add 1 oz of chocolate and unsalted butter. Heat the bowl over a pot of simmering water over medium heat until the butter and chocolate melt half way. Take the bowl off the pot and whisk until butter and chocolate are completely melted. Add cocoa powder to the hot mixture and whisk until dissolves. Add oil and whisk until combined. Allow the mixture to cool to room temperature before adding the beer, whisk until smooth. Add egg, egg yolk and vanilla, and whisk until smooth. Add sugar and whisk until completely incorporated. Now add the flour mixture set aside earlier, fold using a spatula until just combined. The batter does not need to be smooth. 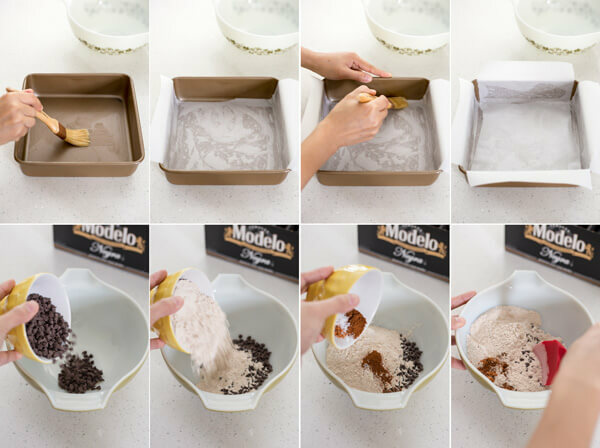 Pour mixture into the prepared baking pan. Bake for 40 minutes. Remove from oven and allow the entire pan to cool on a wire rack. 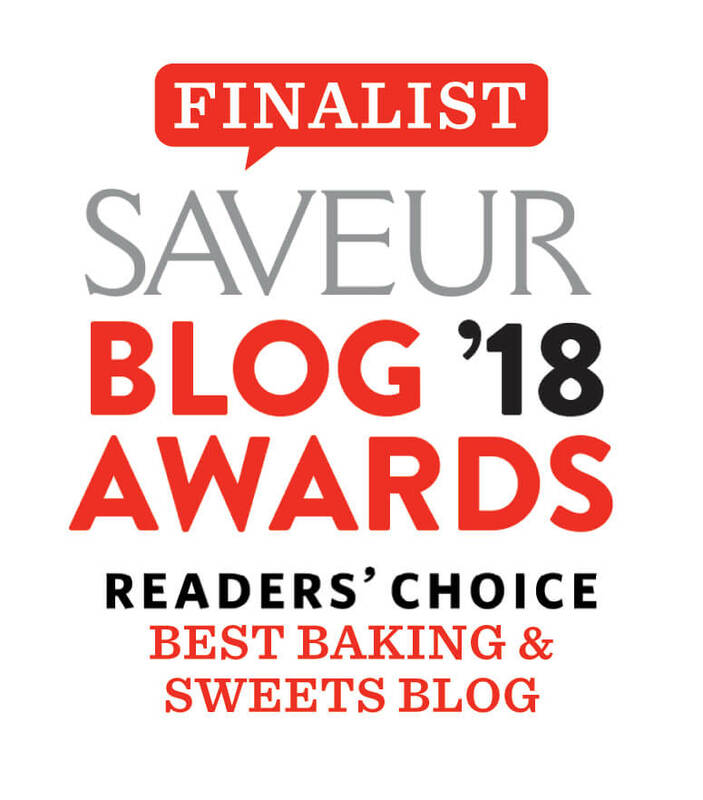 While the brownie is baking in the oven, prepare the ganache. 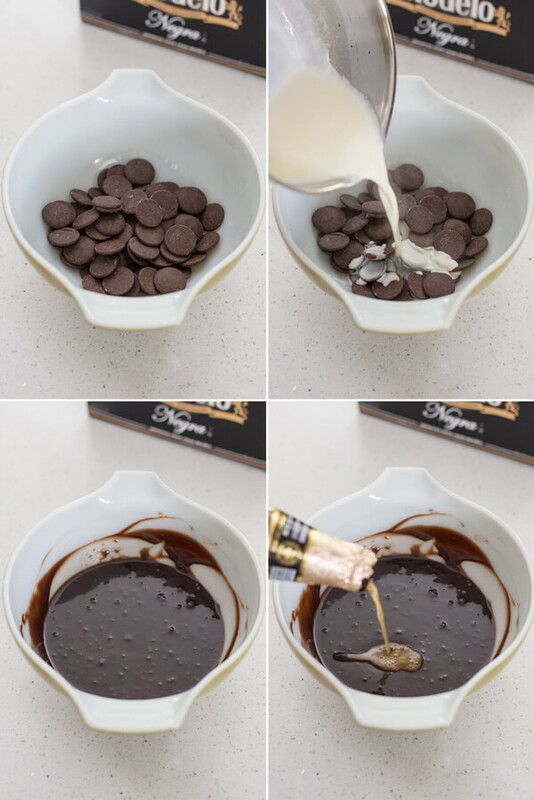 Heat the heavy cream in a small sauce pan (or microwave in a small bowl) and pour the hot cream over the chocolate in a small heat proof bowl. Allow the chocolate to melt for a couple minutes. Stir until smooth and shiny. Add beer and stir until smooth. 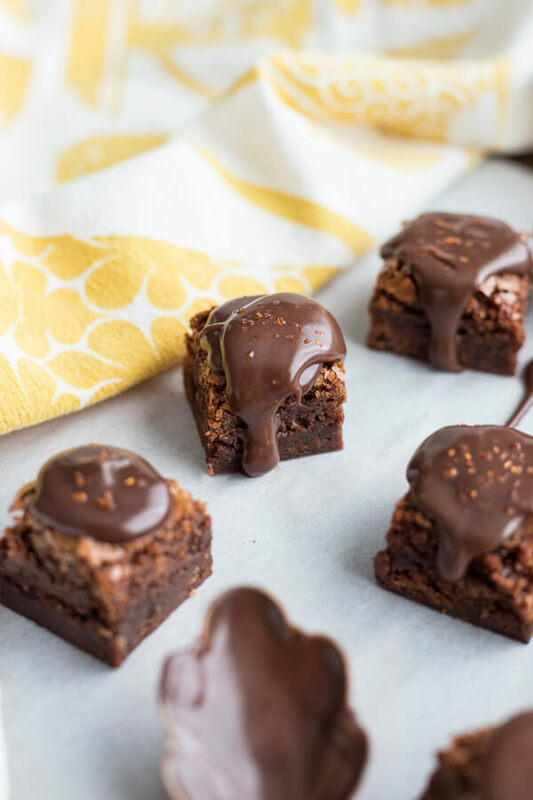 When brownie is completely cool, lift it out of the baking pan and cut into 36 bite size pieces, garnish with chocolate ganache and a sprinkle of chili lime seasoning. What brand chili lime seasoning did you use? Nifty idea to use this spice mix. These do sound amazing. I like this beer so maybe my frostimg won’t get made, lol! Hi Anne, I used Tajin, the low sodium variety. I totally feel ya on the frosting, just take one sip and pour one sip in the ganache, lol! 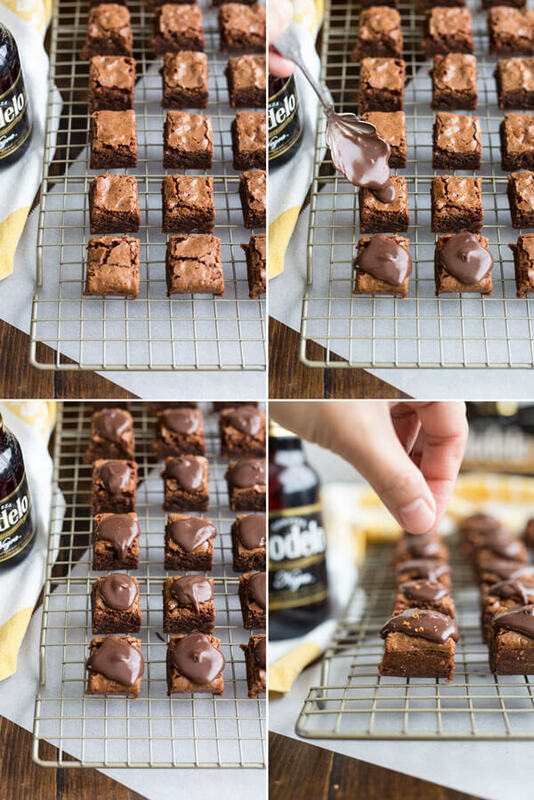 I love brownies and I love beer so this looks like a win win! Pinning! These look insanely delicious. That wonderful ganache dribbling down the side. Wow.